Ladies and gentlemen, are you a boy or a girl? I only ask because I’m getting up there in age, and I can’t always remember pithy things like your gender or name. Also I’m a bit preoccupied with this taste of copper in my mouth, and I keep getting distracted by that damn toast that keeps burning. I’m not even making toast! It’s a strange and wonderful world we live in, Dear Reader, and things can only get stranger and more wonderful after I welcome you to Now Loading…the Video Game Canon! 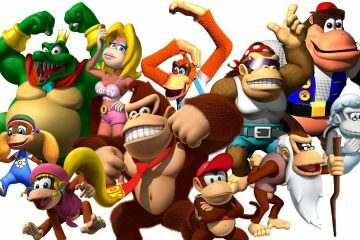 The only weekly Internet column that examines video games from the past to determine whether they should be left to rot in the annals of our memories, or immortalized in the Game Hall of Fame! Last week on Now Loading, we took an extensive look at the indie masterpiece, Undertale. While that article found worldwide critical acclaim and I am currently writing to you from a blimp made entirely out of realized dreams and pure, distilled joy, I shied away from discussing that game’s creator, Toby Fox, and chose instead to discuss the game’s incredible writing and theming. While I stand by that decision, it is worth noting that Undertale is essentially the brainchild of a single, intensely creative individual who purposefully set out to make a game in line with his brilliant vision. With few exceptions, Toby Fox had complete creative control over the look of the characters, the music used in the game, and the story and themes he wanted to portray. To borrow some movie parlance, Toby Fox is a prime example of a video game auteur: someone who has such influence over the creation of the game that that game becomes a direct extension of that person’s creativity. Directors like Alfred Hitchcock, Quentin Tarantino, and Stanley Kubrick, to name a few, all fall under the label of “auteur,” because you just know when you’re watching one of their movies. Likewise, I would argue, there are certain games in which the creator’s vision and passion is so palpable that it becomes difficult to separate the creator from the creation. Could you imagine a modern Legend of Zelda title without Eiji Aonuma’s trademarks? What about a Drakengard or Nier game without Yoko Taro’s special brand of madness dusted all over it? Well, this week we are going to take a look at a game that is the result of not only six years of troublesome development, but also a lifetime of experience from its auteur. We will be looking at a game that was born from a singular man’s childhood, outlook on the world, and intense passion for the interactive medium, evolving into a game franchise that set the world ablaze with its popularity, and continues to be a staple of video gaming to this day. This week, Dear Reader, we will be delving deep into the life and work of Satoshi Tajiri, and the results of his labor and love, Pokémon Red Version. And yes, since it’s the one I had as a wee lad, I will primarily focus on Pokémon Red Version. Now, typically, these Canon articles are structured in such a way that I would introduce the game and then launch straight into the story, gameplay, and other facets of the game in order to judge whether or not it should be canonized. And while I will be doing that here as well, this week’s entry is going to be a little different in that I will be spending time upfront discussing the fascinating history of how these games came to be in the first place. I’ve abridged a great deal of the story here for brevity’s sake, but if what you read below intrigues you enough to further explore this topic, take a look at Anne Allison’s brilliant book, Millennial Monsters: Japanese Toys and the Global Imagination for further fascinating insight into the origin of this series. In the meantime, Dear Reader, allow me to spin a yarn or two for you. The history of Pokémon can be traced as far back as the early 1970’s, when a young Satoshi Tajiri was exploring the streets and fields of Machida, Tokyo, catching bugs and sharing them with his friends. Tajiri was by all accounts a normal kid growing up in the rural landscape of Machida. His proclivity for catching and cataloging insects he found in his outdoor escapades earned him the nickname “Dr. Bug” from his friends and classmates, and he was so invested in this hobby that he dreamt of becoming an entomologist as an adult. And yet, as rural Machida was being paved over into a concrete extension of Tokyo, arcades began springing up all over Japan. With his interests shifting from insect collecting to video games, Tajiri set out on a path that would inform not only his future career as a game developer, but also his place in pop culture history as the creator of one of the biggest franchises on the planet. Tajiri’s interest in video games only grew as more video game cabinets popped up in arcades, and as he became more infatuated with this new medium, he began writing his own video game fan magazine that he titled after himself: Game Freak. Tajiri wrote article after article discussing the mechanics and gameplay of games as they were being released, and together with his illustrator friend Ken Sugimori, he would print and copy issues of Game Freak and put them on the magazine racks of arcades, game stores, and even convenience stores around town. During that golden era of self-publishing fan magazines, it became clear that the passion Tajiri once had for insect collecting had found a new home in the wonderful world of video gaming. Rad as all get out, friend. Like anyone who spends their free time playing and writing about games, eventually Tajiri and Ken Sugimori would launch into protracted discussions about how most video games being released at the time were fairly terrible on the whole. Naturally, the only solution to this dearth of quality was to start making their own games. And so, over the course of a few conversations, Game Freak was changed from a self-published video game magazine into a self-funded video game development company. As it is for anyone starting off on their own, their business was fairly slow at first. It was only when Tajiri picked up a Nintendo Game Boy and the Link Cable attachment that the gears started turning, and, suddenly, years of childhood experience began coalescing into an idea for a game that you could play not only wherever and whenever you wanted, but also with other people via that Link Cable connecting your Game Boy to theirs. A game that captured the childlike wonder of setting out alone into nature, and the thrill of finding a cool insect and cataloging in such a way that you were being an active participant in learning about the world around you. 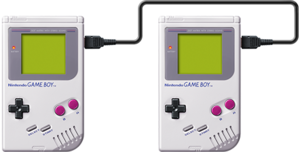 Nintendo’s Link Cable planted the seeds of brilliance in Satoshi Tajiri’s mind—seeds that would eventually blossom into that gorgeous flower, Pokémon. Sure, we all love the HDMI cable, but when’s the last time it inspired a legendary Nintendo franchise? After sitting down with Ken Sugimori, developing the game’s concept, and drawing up some early Pokémon sketches, Tajiri and his group at Game Freak landed a pitch meeting with Mr. Nintendo himself, creator of Mario and Zelda, Shigeru Miyamoto. The pitch left the Nintendo bigwigs a bit confused, struggling to picture the game that Tajiri was describing to them. The scope of the game seemed too big, and the project as a whole came off as overly ambitious. However, they were impressed by Tajiri’s enthusiasm and the barebones game design he and Sugimori had put together, so they offered to fund Game Freak in its endeavor to create their wacky bug-catching game. 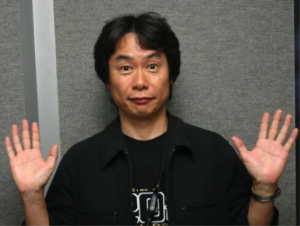 Miyamoto even took Tajiri under his wing, and began tutoring him in the ways of game development. All seemed well for the bright-eyed developers at Game Freak, but what I neglected to mention was that this pitch meeting took place in 1990, and the keen among you will remember that Pokémon wasn’t released for the Nintendo Game Boy until late 1996. Cue the survival horror, folks. Our sweet boy, weathering the storm. The development process for Pokémon was beyond grueling, and over the six years it took to finish the game, Game Freak nearly went bankrupt a number of times. In the middle of developing Pokémon, they actually had to take a break to make a portable Mario title so that they could actually get more funds to finish their initial project. Employees became frustrated with the lack of progress, and then grew to be frustrated at the lack of payment they were receiving, and consequently Game Freak had five employees quit over the course of development. When you examine what they were doing, it’s really no wonder why they would lose hope and quit. First and foremost, the game that Satoshi Tajiri wanted to create had no real predecessors apart from a few role-playing games, and so the people working on Pokémon had a vague grasp of the ultimate vision in the first place. Second, the fact of the matter is that, at the start of the development process in 1990, Game Freak only had one game under its belt, and so the idea of making a game in general was still somewhat foreign to the people at the top. Taijiri’s employees were losing faith in his vision, and losing patience with the lack of progress and payment. And yet, in spite of all this, Tajiri stuck it out, sometimes forgoing his own salary so that he could finish Pokémon. Unfortunately, even when the game was finished, there were still a number of hurdles for Tajiri to jump over before his game became the unstoppable juggernaut that it is today. See, one of the many problems with taking six years to finish a game meant for a handheld system is that handheld systems, even in the mid 90’s, had very brief windows of relevancy. The Game Boy had been on the market for nearly seven years when Pokémon was finally released, so every single video game news outlet was convinced that the game would be dead on arrival. After all, the Game Boy had already seen a pretty steady sales decline for a number of years, and with no new interesting titles being released for the system, it seemed like Satoshi Tajiri’s arduous work and perseverance would amount to a sub-par, quickly forgotten game, with Nintendo’s limp seal of approval shining on him like a beacon of failure. And yet, as we are all now living in the world of tomorrow, we know that Pokémon was not doomed to obscurity, but rather was destined to become one of Nintendo’s most recognizable and successful franchises. I guess old Shiggy knows a diamond in the rough when he sees one, eh? Raise your hands if you have an uncanny talent for recognizing talent. 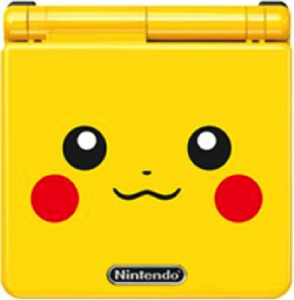 Yes, Pokémon not only stood on its own as a great game, but it also breathed new life into the Game Boy in a way that likely influenced the development of future Nintendo handheld devices like the Game Boy Advance, DS, and 3DS. Making the decision to have Pokémon appear solely on the handheld devices gave people a built-in reason to buy whatever new handheld console was released. 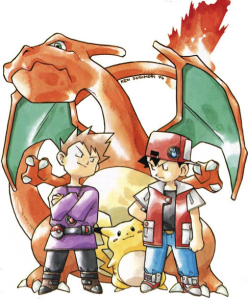 As the sales of his game went from an initially slow crawl to an incredible boom over the course of just a few months, Satoshi Tajiri was able say definitively that he stood by his vision, and that a lifetime of experience, passion, and hard work resulted in a game that he built on his own terms, without compromise—a game that irrevocably changed the gaming landscape for decades to come. Here’s to you, Satoshi Tajiri, a real Game Freak and video game auteur extraordinaire! Ah, to be young and brilliant. And then to be older, and still brilliant. Story and Characters: Your Very Own Pokémon Legend is about to Unfold! So if you’ve stuck with me this far and you’ve somehow never come across Pokémon in your travels through this life, you may be wondering just what it was about this game that took six years to make. Well, when boiled down to its essentials, Pokémon is really rather light on story and characters. It’s all about the gameplay, baby, and while you certainly have a goal as you make your way through the world of the game, this first entry into the series is fairly light on plot. 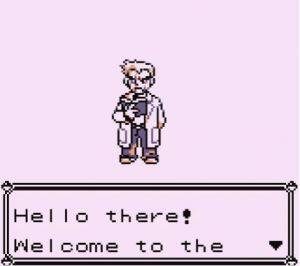 When you boot up the game, you are met by Professor Oak, the self-proclaimed “Pokémon Professor” who introduces you to the basic concept of a Pokémon. Basically, he explains, Pokémon are strange creatures that roam the land. People capture and keep them as pets, or they train and use them to battle other trainers and their Pokémon—sometimes as a way of settling disputes, and sometimes just to have a romp. After you tell Oak your name, he suffers what can only be described as a heartbreaking example of dementia as introduces you to his grandson whose name he cannot remember. Old Oak knows that this pesky kid is his kid’s kid and that he has a healthy rivalry with you, but when it comes to names, he’s just comin’ up empty. 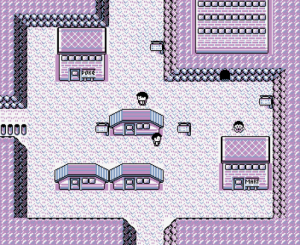 After that unfortunate look at senility, you begin the game in the town of Pallet, and make your way to the old kook’s laboratory so that you can get your first Pokémon companion and set out on a mission to capture and catalog all 150 types of Pokémon in a device called the Pokédex. This device is Professor Oak’s life’s work, and he has tasked you and what’s-his-name, his grandson, with setting out into the world and finishing what he had hoped to start in his own youth. What follows is a fairly standard adventure story as you set out into the world in search of all different types of Pokémon. Along the way, you learn about the Pokémon League and the Pokémon Gyms, which are institutions that test the mettle of trainers and reward them with badges of victory that they can show off as proof of their Poké-prowess. As you continue along in your quest to catch ‘em all and get those badges, you encounter the dastardly Team Rocket, a group of thugs and miscreants who steal people’s Pokémon and use them for various nefarious purposes. 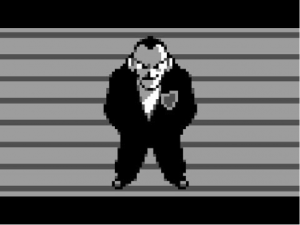 In your travels, you thwart a number of Team Rocket’s plans and even face off against their Mafioso-like boss, Giovanni. Through your fighting fitness, you successfully dissolve a crime syndicate which has been plaguing this world for God knows how long. Well done, you, ya scamp. After defeating Giovanni and saving the world from the Pokémob, you fight your way through the toughest of the tough, The Elite Four, and are crowned the Pokémon Champion… Or at least, you would have been, if what’s-his-bucket, that loon’s grandkid, hadn’t beaten you to the punch. After you win the climactic final battle with your rival, Old Man Dreamkiller shows up to congratulate you on your victory against whoever that kid next to you is. Congratulations, my boy, you have fought against all odds and risen to the top of the ranks! You are the Pokémon Champion! To explain the Pokémon world in a way that intrigues and excites you, getting you ready for your adventure. 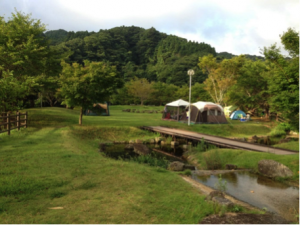 For you to partake in an adventure similar to the ones he had as a child, so that, one day, you too can have a deep appreciation and passion for the thing he has built his life around. And what’s more, Oak tells you that he has spent his entire adult life pouring every ounce of himself into his creation, the Pokédex, and that he is tasking you with filling out the entries of his creation so his dream of fully understanding Pokémon can become a reality. The Pokédex, for what it’s worth, is, like your Game Boy, a diminutive, electronic device that you can carry in your pocket, a device that collects Pokémon data as you explore this vast and wonderful world. To really drive home that final nail into the proverbial Koffing, Professor Oak is a way for Satoshi Tajiri to interact with the player as more than just the creator of the game.  His is the first face you see in the game, and he is the character with the last word of congratulation as you complete the game. Tajiri poured his heart and soul into this game, and so naturally he felt inclined to add a character who was not only inherently knowledgeable about his world, but just as much in love with it as the man who created it was. 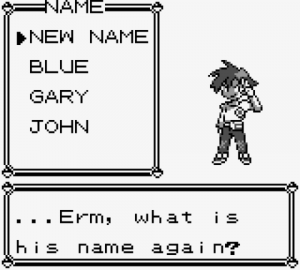 Blue, or “Gary” as he was eventually called in the English version of the Pokémon anime, is a well-written rival character whose jabs at you over the course of the game are effective in spurring you onward in your travels. When he says, “Smell ya later,” in that nasally, taunting tone he no doubt has, you can’t wait to whip your team into fighting shape so that you can rub his stupid nose in it. I’ll give you something to smell, pal. Apart from these three, the only real characters with any substance are the eight gym leaders and the members of the Elite Four. Granted, they aren’t given much to do other than act as a number of different bosses you have to defeat, but each and every character design is memorable, which is all a boss character really needs to be. The story and characters of Pokémon Red Version are simple, but that’s not to say that they are ineffective or uninteresting. That simplicity serves to reinforce the overall theme of the game: namely, the theme of bettering yourself and overcoming any obstacle set in your path. It would be simple to dismiss the eight gym leaders as thin, poorly written characters in a traditional, literary sense, but to do so would be to criminally neglect the general theme of the game that those characters are helping to reinforce. Remember: at its heart, Pokémon is a game about setting out into the world, surmounting impossible odds, and pushing past your limits just as quickly as you are able to recognize that they are holding you back. In this way, the gym leaders being staunch caricatures of the Pokémon type they represent is brilliant game writing without being thrilling literature. Take, for example, the first of eight gym leaders, Brock. Prior to challenging Brock, you have been fighting wild bug, bird, and normal-type Pokémon. Any one of the three starter monsters can easily dispatch these wild types with no real problem. 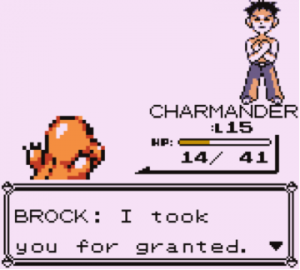 However, Brock specializes in rock-type Pokémon, which are impossible to encounter in the wild before fighting him. The battle starts, and you are met with a limit you did not know you had. Rock Pokémon are fairly tough compared to those wild birds, and, unless you were paying special attention to type-advantages, you will likely have a difficult time. In one fell swoop, the game invites you to believe you are on top of the world, and then puts you in your place by literally throwing stones at your supposed progress. Brock may not have a particularly deep character or compelling lines of dialogue, but his position as first gatekeeper to your realized potential is unequivocally in line with the central theme of Pokémon. Even threshold guardians are subject to Pokémon’s theming. So yes, simplicity abounds in the writing of Pokémon Red Version, but, for a game that has the sole purpose of improving yourself and getting better, simple characters and story beats that reinforce that theme are perfectly acceptable. Here’s a sentence you will rarely read in one of these articles: So the story and characters are pretty thin, but, frankly, that’s just peachy in this game. 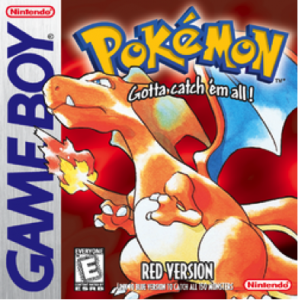 Pokémon Red Version wastes no time in letting you know that it is going to be a gameplay-heavy experience with particular emphasis on exploration, interacting with your friends via the Link Cable, and constantly leveling up your Pokémon so that you can build an unbeatable fighting team. If you had a gun to my head and were forcing me to put this game into a genre, I would likely aggravate your trigger finger by saying that it straddles the line between traditional role-playing games and fighting games. The role-playing aspect comes from the capturing and leveling up of different Pokémon, and then constructing the perfect team to take on any challengers. The fighting game aspect is a little more subdued, and manifests in the Pokémon type system. Each Pokémon belongs to a certain family which are classified in-game as “types,” and learn different moves accordingly. For example, everyone’s favorite mascot, Pikachu, is an electric-type Pokémon, and therefore learns moves like thundershock, thunderbolt, and…well, thunder. Hmm. In this game, the opposing Pokémon’s type determines how much damage your Pokémon does in battle. So, for example, if our friend Pikachu goes up against a water-type Pokémon, he’s going to deal some extra damage with those sparky attacks of his. Conversely, if he’s up against a rock-type, his attacks are going to be grounded immediately and simply not affect the opponent. Most type differences are intuitive like that, with fire being effective against grass-types, water being effective against fire-types, and so on. The game teaches this to you cleverly and subtly in a moment that we will further explore in this week’s BONUS LEVEL section, so stay tuned. These type differences and general leveling-up mechanics make the battles fun and dynamic, requiring you to constantly gauge the advantages and disadvantages that your little monster has over your opponent’s. This keeps the game from becoming stale, and with 150 different Pokémon to capture and use in battle, you can customize your party in any way you like. You are given the choice to build a perfectly balanced team of six different types, making you ready for any challenge that may come your way, or you can do what I always did as a kid and build a team out of your favorite Pokémon. 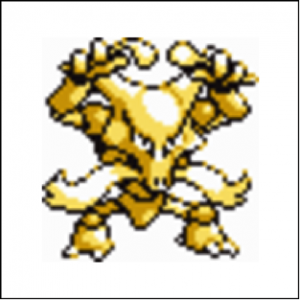 I happened to luck out, though, because my favorite Pokémon, Alakazam, happened to be one of the strongest in the whole game. I’m drawn to power, folks, what can I say? #65 in the ‘Dex, #1 in my Heart. As far as I’m concerned, music is paramount to the success of a traditional role-playing game. If it’s an RPG, you’re going to have to spend a fair amount of time grinding through wave after wave of enemies to level up and become stronger, and the quality of the game’s music can drastically affect whether or not you are willing to invest your time into that process. If the music drones on and on as you mindlessly fight your way through enemies, you will eventually become bored with what you’re doing, and in some cases you may even despise the game for subjecting you to such drivel. Luckily, Pokémon Red Version has enough variety in its soundtrack to make any player crank that little volume knob on the Game Boy and kick out the proverbial jams. From the random encounter theme to the tune that urges you forward at the Elite Four, each and every track in Pokémon is tailor-made to further engross you into its world, as well as to keep you moving forward. There’s a chicken-or-egg question to ask here: was the original music really that great, or do we all just remember hearing it for a good part of our childhood and retroactively view it as great? 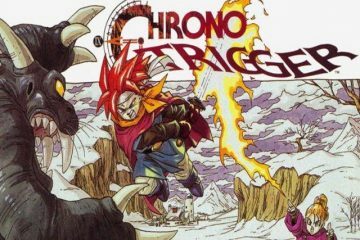 Well, after giving the soundtrack a listen while writing this piece, I would argue that each and every iconic tune holds up incredibly well, and still engages you in a way that most RPGs have a difficult time doing. I suppose in fairness I should disclose that, as a wee lad, my grandfather made me an honest-to-God mixtape that was solely comprised of the Gym Leader battle theme playing over and over again. Nothing can quite get you in the fighting mood like a chiptune battle song. That being said, despite my admitted bias towards this game’s soundtrack, I will gladly argue that each and every song from the game not only fits perfectly in the world the game establishes, but also helps to flesh out that world and make the different towns and locations ooze personality. Finally, the visuals. Frankly, there’s not much to say about the way the game looks, as it’s fairly run-of-the-mill, 8-bit game renders. Where this game shines visually, however, is in Ken Sugimori’s Pokémon sprites. 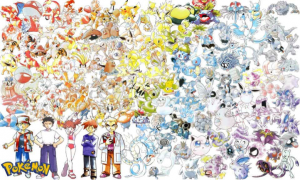 All 150 Pokémon that appear in the game have a unique look: even if you’ve never seen a particular Pokémon before, you’d be able to understand it immediately through Sugimori’s drawings. Even if you have no idea what a Rhydon is, you get the sense from his sprite that he’s a powerful dinosaur, with whom trifling is ill-advised. And really, when the draw of the game is the Pokémon themselves, seeing them in battle, and cataloging them in the Pokédex, the look of the monsters was the most important thing to nail down for this game. Everything else is just world-building, but if it weren’t for Sugimori’s instantly recognizable, anime-like art style, the central conceit of this game would be bland and uninteresting. 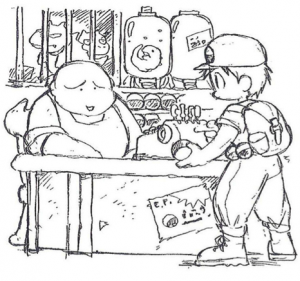 An early Sugimori concept drawing, showcasing his initial idea that Pokémon would be bought from capsule machines. So, with a unique battle system, a soundtrack comprised solely of earworms, and an art style all its own, Pokémon Red Version has scored very highly in this section. I have already touched on the incredible impact these games have had, and I would wager that in this case, each and every one of my Dear Readers has some familiarity with Pokémon’s massive impact not merely on video game culture, but on worldwide popular culture in general. As I mentioned, Pokémon Red and Green Versions were met with a slow, creeping success that eventually exploded with the white-hot intensity of a star being formed, with the games spawning a successful manga and anime show that took both America and Japan by storm. And while it’s true that those first two games were on people’s collective radar, it wasn’t really until the release of the sequel games, Pokémon Gold and Silver Versions, that the series’ popularity nearly eclipsed the sun. Pikachu was a prominent float at the Macy’s Day Parade, kids the world over dragged their parents into theaters to see movie after movie. There was no denying that the little game that could which took six years to complete had become a flagship franchise for Nintendo. Then, like any true auteur, Satoshi Tajiri got out while the getting was good and relegated his role in future sequels to simply “executive producer,” allowing other people to take the creative reins on the game he had slaved over for years. And so it was that, after the earth-shattering success of his first and second games, Tajiri extricated himself from the development process and became simply the keeper of the flame, the master of his own creation. 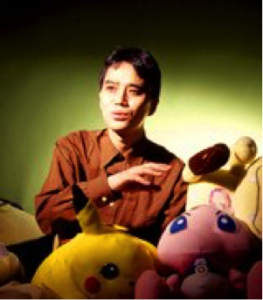 So let us raise a glass to the man behind the phenomena, the visionary who wanted nothing more than to share that genuine feeling of wonder from his childhood: our very own Pokémon Professor, Satoshi Tajiri. A brilliant creator fixed the meaning of the word “auteur” for the interactive medium, and whose dedication and hard work brought the world one of the most engaging video games of all time. And let us not forget that, for all his work and all the fame his series has received over the years, he, much like Professor Oak, is just happy to have shared his experience with you. Earlier, I mentioned that Pokémon Red Version is a prime example of subtle player tutorial. There are one or two instances in which the game deliberately tells you how to do something; for the most part, though, you are left to your own devices and must determine from context clues how exactly you are meant to play the game. For example, take those type advantages and disadvantages I mentioned earlier. An argument could be made that those differences in type boil down to elemental oppositions, and are in some way intuitive. It stands to reason that Average Joe Player can surmise that water is strong against fire. On the other hand, though, for many children who picked this up as their first-ever video game, those conventions may not have been readily apparent from the start. So we run into the potential issue that the battle system is hard to understand or confusing, and the problem then becomes: how do we explain it to the player? I have this pet theory that human nature demands that we all harbor a visceral hatred towards obvious tutorials. Whether it be the fact that most tutorials appear as condescending to anyone even slightly familiar with the concept of video games, the aversion that we as gamers have to having our hand held through a mechanic, or just the simple fact of life that no one really likes to be told what to do, most players cannot help but bristle at a brazenly obvious tutorial. But hey, a guy’s gotta know how to play the game, right? So some sort of explanation is necessary, but when a game breaks its own sense of reality by using real-world terms like “Press the A Button to do this,” it leaves a sour taste in our mouths. The difficulty in creating in-game explanations and tutorials, then, is to flawlessly integrate them into a part of the game that you control. 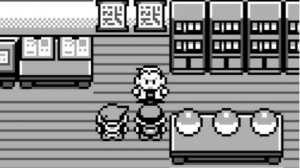 Take, for example, choosing your first Pokémon in Professor Oak’s lab. If you knew nothing about Pokémon before playing this game, all you know about this world is that sometimes people keep these things as pets, and other times people battle with them. You know that Oak is interested in just collecting them, but you’ve been explicitly told that people use Pokémon for more than just research purposes. Lying before you are three choices: Bulbasaur the grass-type, Charmander the fire-type, and Squirtle the water-type. You get their type information when you select them, so you know through reading their descriptions that different Pokémon have different types. At this point, you still have no idea what the relevance of that is, but at least you have been introduced to the concept. There stood I, aghast at eternity lain out afore me. You know from what Oak told you that people fight with Pokémon. You know that there are many different kinds of Pokémon all over the world. You learn from reading the descriptions of the three choices that Pokémon have different types. You know your rival is out to get you, and that he always chooses whatever will give himself an advantage over you. You can conclude that, even beyond simply leveling up your team, there are other factors when it comes to winning in battle. 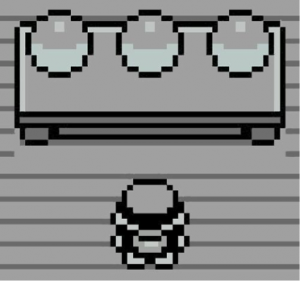 Just like the story and characters, this choosing of your first Pokémon is a simple moment in the game that provides you with just enough information to figure out how battles could be set up, without berating you with long and boring blocks of text explaining how every little thing works. Though undoubtedly difficult to execute, this game elegantly pulls off what many modern games have trouble doing. Pokémon was, and still remains, a joy to play. Though it had a long and troubled development period, Satoshi Tajiri’s dedication to his vision and certainty that the game would be something special propel an already excellent game into a truly legendary position. 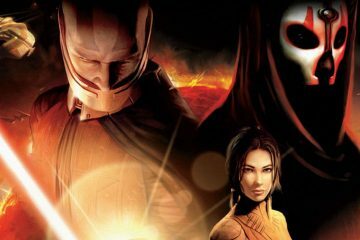 These first entries into the now ubiquitous franchise were not only fantastically designed games, but also a unique view into one man’s childhood passions and dreams that he made into reality through sheer force of will. 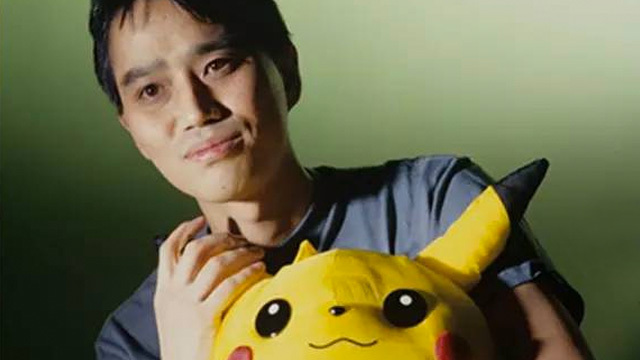 Auteur theory has a history of being fairly confined to cinema and filmmakers, but if there’s any game designer out there with vision enough to be lauded among those brilliant directors, I can think of no better candidate than Satoshi Tajiri. Welcome to the Canon, Pokémon Red Version! Congratulations! You and your franchise are Hall of Famers!